An international team of astroboffins have discovered that the nearest single Sun-like star has one planet orbiting in the sweet spot for potential alien life. 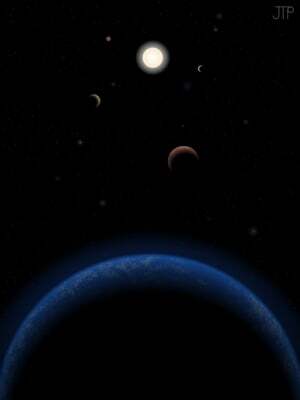 Tau Ceti, which is just 12 light years away and can be seen with the naked eye in the night sky, has five planets in orbit around it, with one lying in the habitable zone. The potentially life-supporting world has a mass around five times the size of Earth, making it the smallest planet found in the habitable zone of any Sun-like star. The other four planets are between twice and six times the mass of Earth. "This discovery is in keeping with our emerging view that virtually every star has planets, and that the galaxy must have many such potentially habitable Earth-sized planets. They are everywhere, even right next door!" said Steve Vogt of the University of California Santa Cruz. "We are now beginning to understand that Nature seems to overwhelmingly prefer systems that have a multiple planets with orbits of less than one hundred days. This is quite unlike our own solar system where there is nothing with an orbit inside that of Mercury. So our solar system is, in some sense, a bit of a freak and not the most typical kind of system that Nature cooks up." Tau Ceti's worlds were spotted by astronomers from the UK, Chile, the US and Australia when they sifted through more than 6,000 observations from three different instruments using improved "noise-modelling" techniques to spot the wobble in the star caused by the gravitational tug of planets. 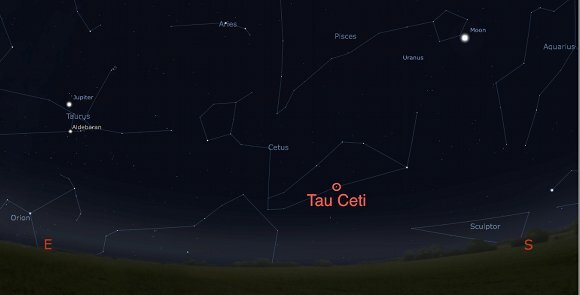 "Tau Ceti is one of our nearest cosmic neighbours and so bright that we may be able to study the atmospheres of these planets in the not too distant future," said James Jenkins of Universidad de Chile, who is a Visiting Fellow at the University of Hertfordshire. "Planetary systems found around nearby stars close to our Sun indicate that these systems are common in our Milky Way galaxy." So far, noise modelling and other techniques have mostly found high mass planets, since smaller worlds are harder to detect.